Wow! 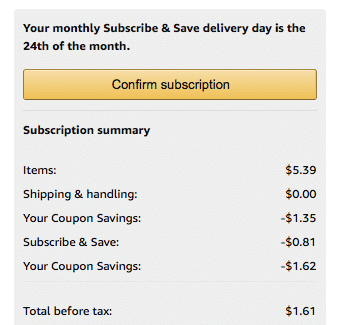 RUN over to Amazon where they have 2 coupons you can stack on Honest Co.’s detangling spray! Makes for a bottle as low as $1.61! I got mine! Just follow the instructions exactly as shown below. As low as $1.61 after coupons and 15% S&S! PreviousPrevious post:Target’s July Beauty Boxes $7 Shipped- Includes $3 off 15 Coupon, Acure Facial Scrub, SheaMoisture Body Scrub & MoreNextNext post:HOT! HOT! HOT! Honest Co. Shampoo/Body Wash $2.24 with Double Stack Coupons (reg. $10)- Hurry!